Posted on February 14, 2017 by Eugene Chung / This entry was posted in Informative, New Products and tagged dabbing, DrDabber, e rig, Electric rig, notorchrequired, rig. Bookmark the permalink. For years the team behind Dr. Dabber Vaporizer Pens & Vape Accessories had searched high and low for the ultimate vaporizing experience. An experience that minimizes health risks without sacrificing enjoyment or flavor. Although many novel concepts were available, none were able to achieve the perfect balance that the Dr Dabber team were looking for. Behold the most innovative rig in the concentrate & oils market. 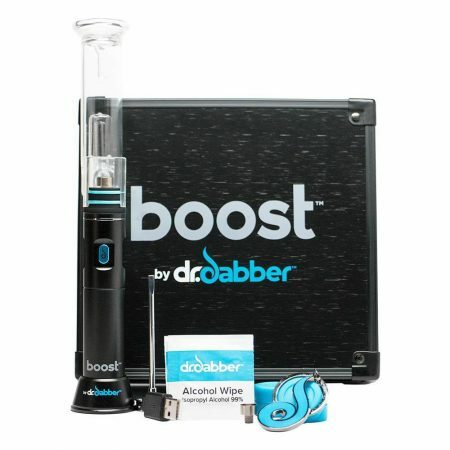 The Dr. Dabber Boost is the first portable, battery-powered dab rig for essential oils, employing a titanium domeless nail much like you would see in traditional glass dab rigs. No torch required. After USB-charging the Boost, load the glass percolator with a small amount of water — about 1/4-inch full — and click the button three times when using the titanium nail, or five times when using the ceramic nail. The device heats to an optimal temperature with a simple button press, making it one of the easiest dabbing solutions available. Click the power button 3 times when using the titanium nail/ceramic nail, or click 5 times to unlock a higher heat setting for use with the quartz nail (included). When attached to the included glass water filtration piece, the Boost replicates the dabbing experience perfectly. Capable of 30 to 40 uses on a single battery charge, the Boost eRig truly is the best of both worlds: a portable dabbing experience without any sacrifice. The body stands about 5.5 inches tall and holds a battery (18650-sized, BestFire-branded, 2500 mAh, 35-amp overly-optimistic rating) that powers a protruding ceramic heating rod on top of which slips a titanium, ceramic or quartz nail. A spill-resistant glass percolator mouthpiece about 4.5 inches tall snugly attaches to the body. Combined, the Boost stands about 10 inches tall. It looks and feels nice too. The body is mostly metal and feels sturdy, and the glass is super classy. The thought put into the attachment points shines through. Friction from two o-rings keeps the glass percolator snugly on the ceramic top. A weighted base attaches to the body with neodymium magnets. The carb cap has a detachable handle that also uses a magnet. This creates the most seamless rig setup with hassle-free fulfillment. Here at Sunflower Glass – we give the Dr. Dabber Boost an A rating for the convenience of not heating up your nail with a torch. Simply, press the button and dab on! 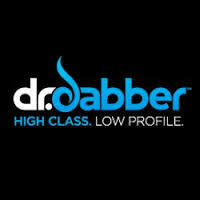 We also carry other Dr. Dabber vape pens as well if you’re looking for a more discreet and casual device.